Tamahagane is a Japanese type of steel that is used to make samurai swords and knives. It is unique to Japan and was traditionally created in a process that took months on end. Swordsmiths would smelt iron sand and charcoal in a tatara furnace until the iron and carbon elements fused together, making tamahagane steel. Each of our swords are handcrafted with the utmost care and attention to detail in the traditional Japanese steel. 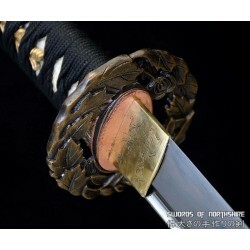 We have a variety of tamahagane steel katanas that can be sharpened to your desired edge. All of our swords can cut through thick bamboo, small trees, and more. Whether you want to use your sword in combat or as the centerpiece of your collection, the tamahagane steel sword will not disappoint. Looking for something unique to you? Create your own, personalized Tamahagane custom sword.